Orosco and his son Patrick (in 3rd place here), both of Monterey, CA, finished 1-2 on Sunday, with Patrick winning. The star of the show, though, was Bert Skidmore (great racing name!) in #17, Anthony Wang's 1958 Ferrari 250 TR. Skidmore challenged the Oroscos in their far more nimble cars with the best display of Ferrari driving I've seen in the modern historic racing era. Don Orosco's 2500cc. 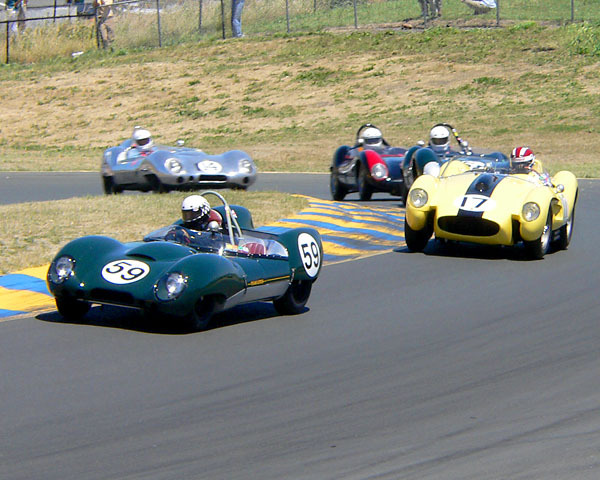 1958 Lotus Mk.15 ran with its 2.5 liter Climax "in period" with Roy Salvadori driving.